Inflation - tame but under control? 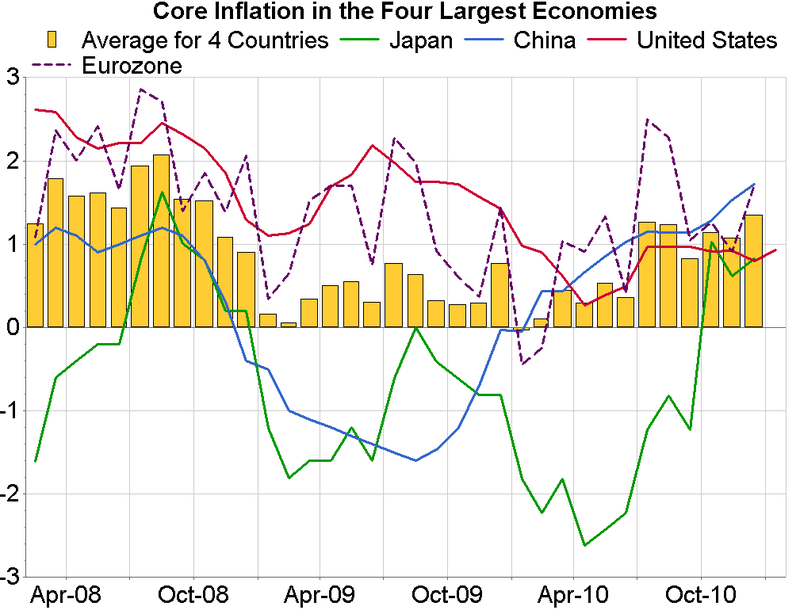 Since the global recovery started in the string of 2009, inflation has been moving higher. The US recession ended in June of 2009, so the rate of inflation has doubled since that time. 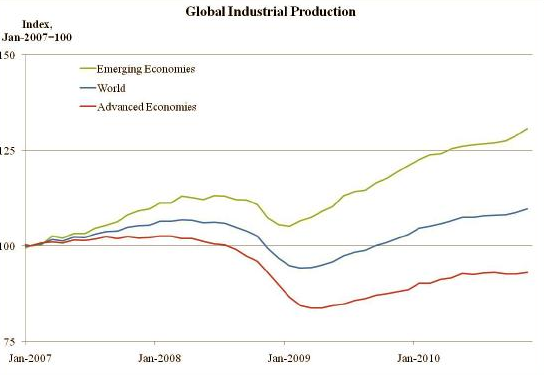 We are not at 2008 levels, but the major economies are showing signs of rising prices. The issue is whether inflation is under control. 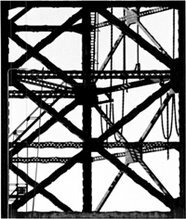 It is tame, and it is following the path expected by central bankers, so it is hard to say that anything is out of the ordinary. The fears are not with the next two of three quarters but what will happen over the long-run, if central bankers do not start the tightening process at the right time. 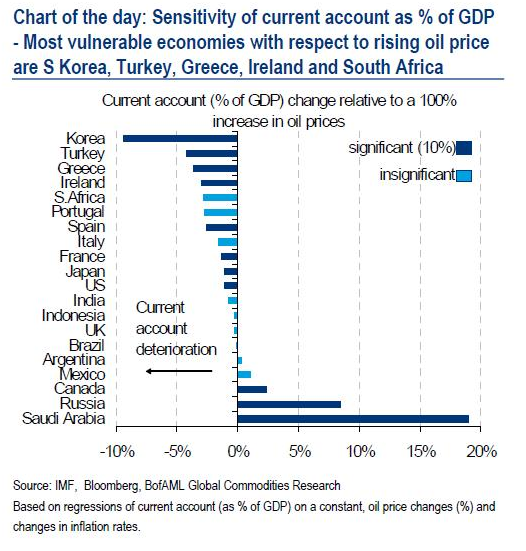 The sensitivity chart shows that a oil price shock is not going to help everyone the same way. 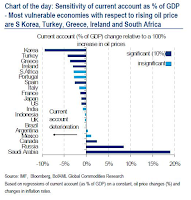 For oil producers, the current account surplus will increase. While those countries that have high oil imports will see deterioration of their terms of trade and a decline in their current account. Many of these countries are not in good financial shape, so the price increase will further enhance the economic difficulties of those with debt problems. The charts above are from St Louis Fed president Bullard. The quick take on the QE2 policy is that it is working as expected. One, TIPS break-even inflation rates have increased from their lows. Two, stock prices have increased from their lows. The monetary eases has had the desired effect on financial prices. Three, real rates have increased, consistent with higher economic growth. All is good! However, there is a potential problem when we look at output gaps. The story hear suggests that there may be less slack in the global economies than expected. If this is the case, there may be more room to tell a inflation story that could be less controlled. We may be early in the process, but this is the fear for many investors. 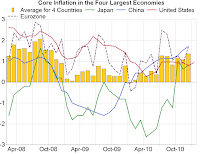 Could higher commodity prices be deflationary? With oil prices rising from geopolitical risks in the Middle East and with supply shocks in many commodity prices still upon us, we have to ask the question of whether the price gains are related to inflationary expectations or just supply imbalances. The supply imbalance story especially for oil would suggest that the higher prices will negatively affect consumer balance sheets and production costs. In this case, economic growth would slow and the net effect would be for another recession. This could lead to lower core inflation rates or deflation. The inflationary expectations story is that commodity prices will gain because excess cash is used to buy commodities as a store of value. At low interest rates, the cost of holding commodities is low. Clearly, index interest suggests that commodity demand is on the rise, but the pass-through to the economy is more uncertain. The problem for central bankers is trying to separate what is going on with prices. This is not easy and makes the chance for overshooting greater. The classic theory by Rotemberg and Woodford (1996) is that a 1pc rise in crude prices cuts 0.25pc off US output over six quarters or so. If they are anywhere near correct – and the “energy intensity” of the US economy has diminished over time – the sort of 40pc rise since last summer rise will indeed have a severe effect. Subsequent scholarship suggests this is too extreme, unless central banks behave like idiots. 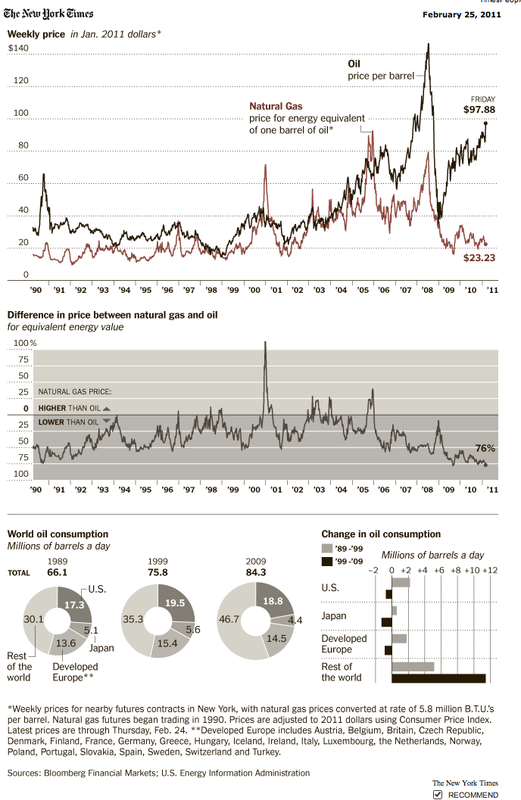 The New York Times produces a good graphic on the relative dynamics of oil and gas. They are both in the energy markets but they represent very different supply and demand dynamics. Oil is global market which has strengthened on the demand from developing countries while the natural gas market is more localized and will be effected by relative supply within a region. It is interesting that there are no G10 countries in this list. Nothing from Eastern Europe. One oil country from Africa and no Latin American countries. The real issue is what policies are necessary to become a 3G country? Clearly all of the above countries are headed in the tight direction, but it is less clear how stable are those trajectories. Just be long stocks and do not worry? Gold silver ratio seems out of line? CNY startng to increase - a trend?